One of the main inspirations for DePalatis publishing this book is his wife, Caroline, who published a novel of her own, “Jumping Out of the Mainstream,” about their family’s travels in China. The teacher also notes the teenagers with whom he works as inspiration, and he has included stories of various students who have struggled with achieving a mature and constructive relationship with their parents…and vice versa. 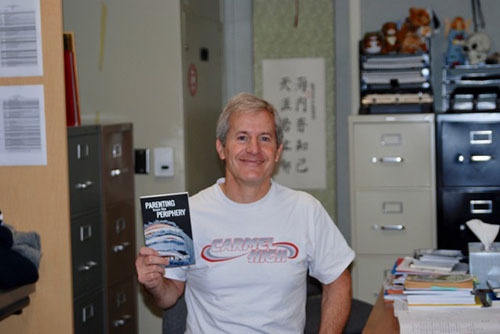 The Alaska nativewrote “Parenting from the Periphery” as a response to speaking with various Carmel High School students over his 30-year career as an English teacher, noticing that many parents, when their children become adolescents, will either continue their forceful paternalism and alienate their children or renounce all restrictions and let them make poor choices. He advocates for a loving parent-child relationship with the right amount of slack to allow children to develop and entertain their own personality. In “Parenting from the Periphery,” DePalatisuses the term “parenting from the periphery” to describe setting a loose framework of regulations upon a teenager so the teen has the opportunity to make mistakes within manageable bounds, while the parent openly discloses the negative ramifications of various actions to their child. Healso advocates for parents to ask their adolescents what they want instead of telling them because they are at a period where they diverge from their parents’ paths and they’re looking toward different adults to model and will expect to be treated with a greater degree of respect from their parents in order to take them seriously. “Parenting from the Periphery” also highlights the importance of a mentor in a child’s teenage years. Since adolescents begin to respect the authority of other adults over their parents, advice given from a parent will tend to sound less appealing to a teenager than advice given from other adults, so influencing the mentors that your child looks up to, and asking them to relay messages to your child, are great ways of raising your child if they aren’t receptive to a direct confrontation. DePalatisfinished writing the book two summers ago and has spent the time since working on the format and design of the material, noting that he’s used a lot of help from his family members in the process of taking his words and arranging them into an actual book. Copies of “Parenting from the Periphery”are available on Amazon in paperback and Kindle form.